吃喝玩樂 - Diary of a Growing Boy: What, no holes in my tablecloth?! An old friend is back in town for a visit after a prolonged absence, and we made plans to catch up. In spite of the inconvenience of Occupy Central, we decided to stick to our original plan and meet up for drinks at Butler. I started with a more "girlie" drink... 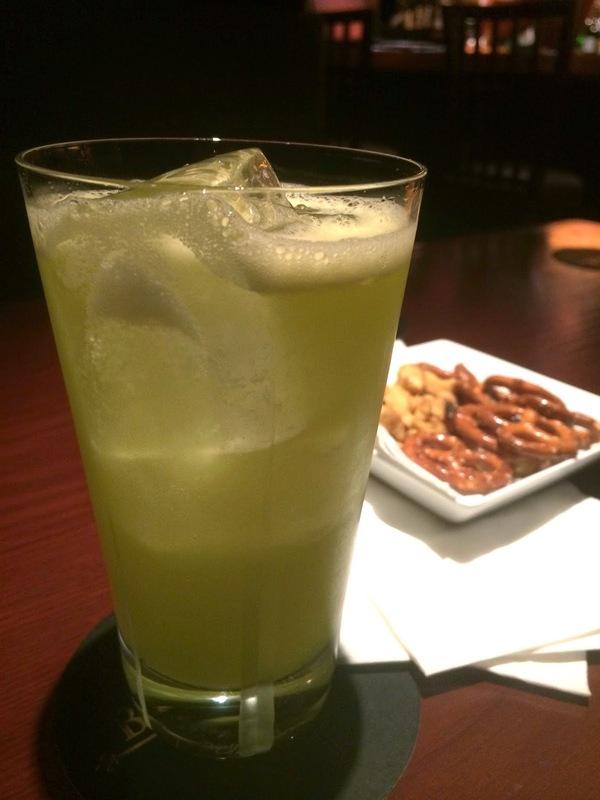 It's been years since I last had a melon ball, and since I was at a Japanese bar... This was not bad at all. 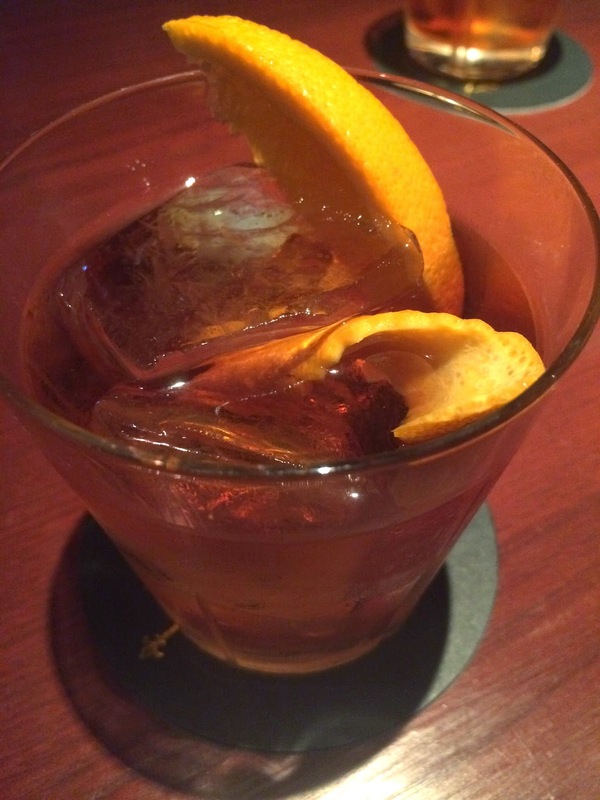 Then I was ready to move on to a "real" drink... and these days I'm liking negroni. The version here was pretty damn bitter, with nice citrus flavors and fragrance. Yum. We nibbled on some sausage platter, but still needed a real dinner! So we adjourned right next door to Spring Deer (鹿鳴春), one of the classics in this town. I haven't been back here for more than a decade... and I was pretty excited about going back. Stewed ham and Tientsin cabbage (上湯火腿炆津白) - absolutely not surprised that at an old school Chinese resto like this, the veg dish came first instead of last as it's supposed to... Gotta say the flavors were pretty old school, too. Very yum. 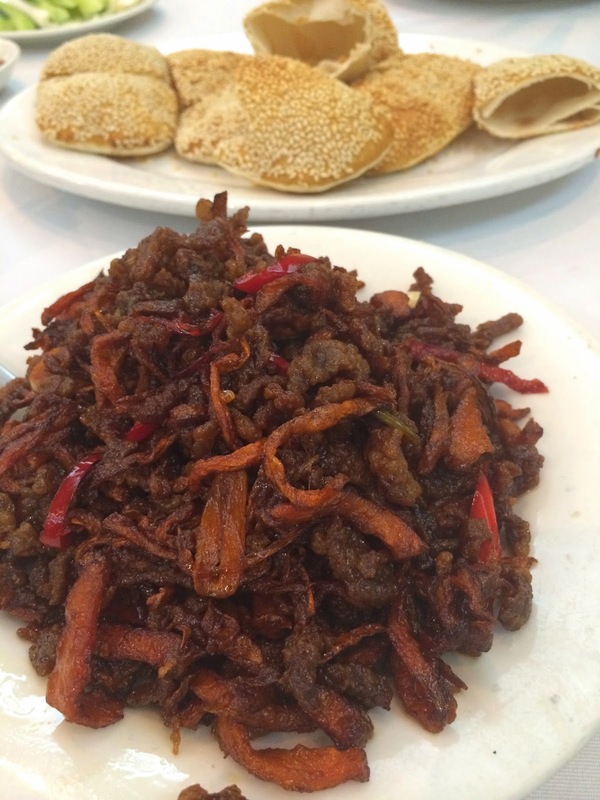 Fried shredded beef with chilli sauce (乾炒牛肉絲) - very yum! This was the dish that we were expecting at Fu Lu Shou, and the execution here is much, much better. In addition to the sweet batter, we could at least taste the beef, and there was shredded bamboo shoots, chili peppers and garlic - all of which contributed a whole lotta flavors. And these were stuffed into sesame seed pockets. The restaurant serves northern Chinese, or Pekinese cuisine (京菜). Naturally the signature here is roast Peking duck (北京烤鴨) - the kind with lots of fat underneath the crispy skin; the kind where you can just see the liquid duck fat drip down as the cleaver goes through the duck... Very old school. And since we didn't request other preparations for the duck, we got the meat and the skin together in the same slice. The ducks here aren't young and the cuts can be thick, so the texture was a lot firmer compared to what one might find elsewhere. The pancakes here were also very old school... not the delicate, paper-thin variety at some of the finer establishments. These were the thick and floury kind. Deep fried mutton by Peking style (京燒羊肉) - another classic Pekinese dish. Love that fatty, lamby taste! We were completely stuffed, but I for one was very happy and satiated. I think it's important to make time and visit old school establishments like this - where they still cook the food the same way as it has been for decades. It may not be fine dining, but delicious nevertheless.